Egads, have you all seen Verve Visual's May release??? I LOVE it all. 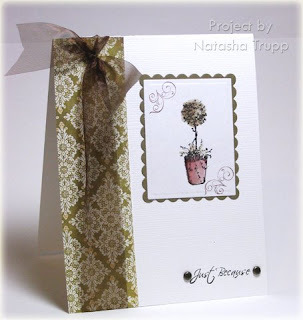 Here's a quick card featuring the Floral Whimsy set. I modified the sentiment a bit. I thought this one worked nicely as well- Believe in the Beauty of Dreams. The original quote is "the future belongs to those who believe in the beauty of their dreams". If you're wondering how I omitted the other words... I didn't use a marker. Instead I stamped the phrase on an eclipse masking sheet. Then I cut out the words I planned to use, keeping the rest of the phrase connected. I placed that on my paper, then stamped away. Voila, a new quote! I also had fun making the pattern vase. 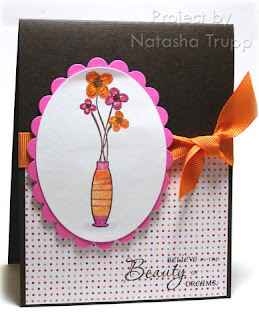 I used two stampin' spots, inking up the middle with orange, than added the pink along the ends, as well as pink stripes on the orange. The small shadow under the vase was added by a grey alcohol marker. Here's another scene card with some Doodle Factory images. 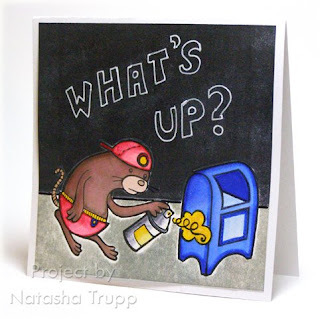 I thought about having this particular critter spray painting a wall, but a mailbox seemed more appropriate. I stamped the critter and the mailbox first. Next I masked them, and brayered the grey wall, then the ground as well. The images were coloured in with a mix of markers, reinkers, aquabrush, and blender pens. I really wanted some sort of graffiti message, but I went with hand drawn block letters instead. I'm not very good at making tags. Hello! 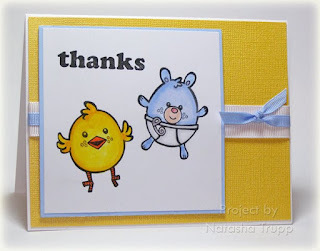 Thanks for the comments and feedback so far for the Clean & Simple Stamping blog! I appreciate it! 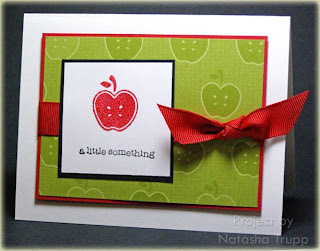 I know this next card definitely fits into that style, but I wanted to share a little Stampin' Up!. It's always nice to go back to where you started. 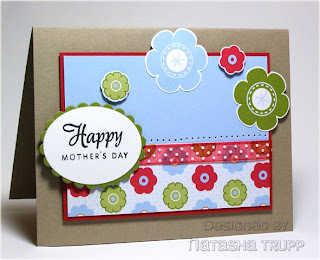 I did use one non Stampin' Up product on here- that would be the scented embossing powder. No, I haven't yet found an apple scented powder. However, I figured cherry would work just as nicely. The important thing is it's red and it smells fruity. So, I have had this idea kicking around in my head for a while... I thought it'd be fun to have a specific location for those "Clean and Simple" type cards. I thought it'd be a great place to showcase examples of this stamping style, as well as tips and ideal techniques. Here's a glimpse of my first posting over there. 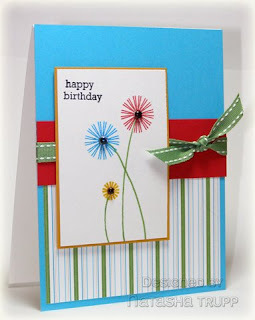 Check out the Clean & Simple Stamping blog for some tips on the Clean and Simple style. I will still be updating here, I know it's been less frequent as of lately. What can I say, it's just a busy time of year. I have a few deadlines, but after that, I should be back to an almost daily uploading. As far as the CAS blog, I would love to get some other designers on board to showcase what this style means to them. Well, I am busy working on things that must go unshown for a week or two, so I thought it'd be fun to show one of my very favorite Dirty Dozen designs. This one was done for a sketch challenge. 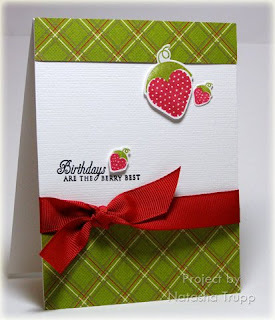 It features Lizzie Anne Designs-Au Naturale Stamps, and Twinkling H2Os. It's just one of those cards that I fell in love with. I actually chose to part with it, but I know the recipient hangs on to stuff like that, so I was okay to let it go. Today's card started out with an idea I had while trying to sleep last night. Isn't that great, even when you're trying to fall asleep, these creative ideas just pop into your head? 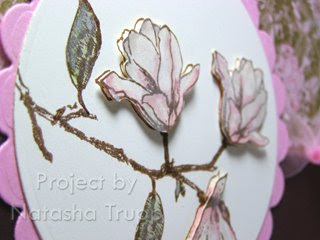 The idea was to do a bit of paper tole with these magnolias. I ended up just doing one popped up layer, but the effect is still noticeable. Using the branch stamp, the 2 different magnolia images, and the leaf, I put together a glimpse of a magnolia tree. 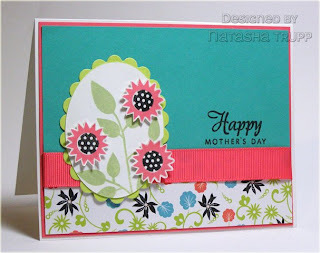 I stamped, cut out, coloured, and attached the flowers one layer up. I also applied a layer of Pure Mica Metallic Luster to give the blossoms more shine. 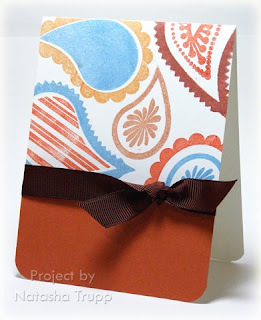 The card base comes from the Basic Grey Sugared 6x6 paper pad. The angled twist to a fall-to layout came from an oops at the paper cutter (while I was cutting a different paper, some chocolate chip cardstock was underneath). Here's another card that I made a week or so back. Once again, I felt the need to use some of my new designer paper. This time, it was a piece from the Summer Picnic collection that inspired the rest of the card. I started with the dotted paper, then looked through my stamps and decided to continue with the dot theme. I chose the boots from PTI's Green Thumb. I stamped one on the actual panel, and stamped and cut out the other one. I've just felt a tiny bit swampled lately, not in a bad way either, just not having much time to do creative things. Over the next few days I should have the chance to catch up though! I should have a number of fun things to share. Here's a quick card I made a few days back. I had just received the East Coast Prep papers, and wanted to use them. I pulled the colours from this striped piece and based my card on that. For this card, I actually pieced together everything else before the main panel. I tend to make the main panel too big, then my ribbon has to go too far to the right or left. So this time, I got the placement of that, then decided on a panel size. Finally, only at that point, I decided on what I would even put on the panel. I made it a birthday card, because I can always use more of those. Oh my goodness, do I ever love this new floral set from Flourishes! I was about to stamp this image on some white paper, but then I recalled how lovely vanilla is. I stamped it on vanilla, coloured it in with markers, reinkers, and blender pens. Next, I used some Eclipse masking tape to mask the image. I stamped a script background over top, then sponged all around the edges of the panel, and of the flower. 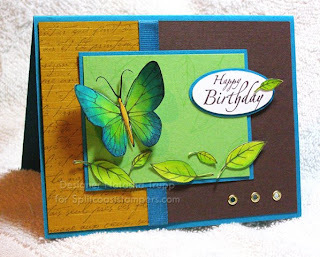 I was just in the mood for a really worn look for this card- lots of sponging, lots of distressing. I really love how it turned out! Today, I've got a sneak peak at one of the new Flourishes sets being released this week. 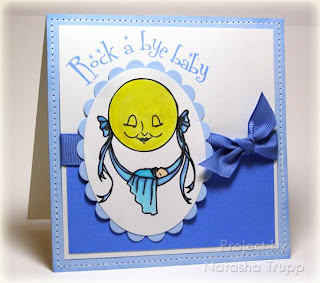 This one is called Rock a Bye Baby, and it has some absolutely darling images in it. For my card, I stamped the image, then coloured it with copic markers. I wanted the moon to really twinkle, so after I coloured it with markers, I added just a touch of twinkling H2os, yellow rose specifically. The card is a big format, 5.5x5.5. I cut the main image out with some oval nestabilities, then reshaped the sentiment so that it would follow the shape of the oval. I added some faux stitching to the card base, and some ribbon, and it was all done! 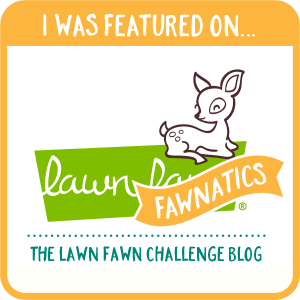 Also, you'll probably want to check out Sharon's blog, as she has some exciting news! The other evening, I sat down to make something, anything. 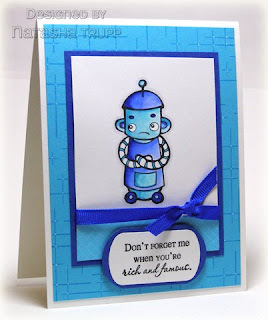 My sister insisted I make her a card, her 2 requirements: Use one of the robots from Doodle Factory's Urban release, and use blues. I could handle that. I had just received my Great Expectations sentiments from Verve Visual, so I also wanted to bring in one of those sentiments. I started with the robot. I stamped him, then set about watercolouring him with blues. I thought he kind of looked a bit pouty (especially being blue now), so I went through the sentiments and found "Don't forget me when you're rich and famous". It fit quite nicely with his face and body language. The background turquoise seemed too plain, so I stamped the Crosshatch background on it and highlighted connecting lines with a white gel pen. My sister was quite pleased with the end result of her "challenge". Well, I have to say, this weekend kind of snuck up on me. I had it in my head that next week was Mother's Day. At least I was set straight before today! I had 3 cards to make. I thought about being boring and making 3 that were at least the same layout, but I just couldn't do it. Each one was specifically made for the recipient. The first one is for my mom. I wanted something cheerful, a bit summery and fun. Plus, I wanted to try out Beate's weekend sketch. This one actually has very minimal stamping, but it was still a bit of work with the all the cutting. I used some of the Summer Picnic papers for my flowers. The small flowers are all from one piece, and the larger flowers are from a different piece. I really like the look of the red, bashful, and olive with a kraft base. Inside the card it says "You're Amazing", because my mom is pretty amazing! Next up, this one started out because of a certain trip to Michaels on Friday... I have a soft spot for SEI papers, and they had paper pads on sale. This one is from Black Orchid. It's a fun mixture of celery, black, white, coral, and aqua. I looked through my floral stamps and found that these ones from PaperTrey's Beautiful Blooms were the best match. This card if for one of my grandmothers. She's got a bright, personality, and the coral reminded me of her. For my other grandmother, the first thing that came to mind was roses. She has the entire Country Roses china collection, and likes rose scents, and of course the actual live flowers too. So I had to use Kitchen Sink Stamps 3-Step Roses. I thought about doing the pink-red of the Country Roses china, but I thought yellow would be a nice choice too. I used So Saffron and More Mustard for the roses, and Celery, Wasabi, and Garden Green for the Leaves. This mother's day sentiment comes from one of the retired All Year Cheers. I wanted a bit of something one the saffron background, so I stamped some French Script. Supplies: Stamps- Kitchen Sink Stamps 3 Step Roses & Hearts, All Year Cheer, French Script, Ink and Paper by Stampin' Up! Thanks for stopping by today! Happy Mother's Day! 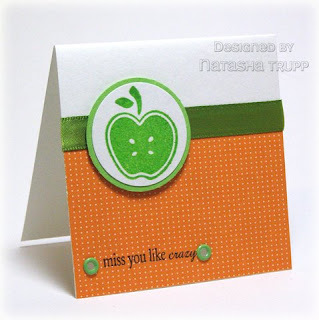 I know it's been quite some time since I posted anything with Stampin' Up! product. It's not that I don't still love their stuff, but I just feel like I haven't had much time for stamping lately, and I have all this other stuff on my desk. So, what changed? Well I finally put in an order for some stuff from the Occasions mini. I cannot get enough of fruity stamps. I love them all, I wish there were more! So when I saw Tart & Tangy and the matching paper I had to have them both. First off is a small 3x3 note card. I'm not sure what I was thinking with putting the phrase where I did, but what's done is done. It's clearly unbalanced, and the one eyelet is way too close to the word "crazy". But you know what, the cheerfulness of the green and orange are just too cute for me to fret too much about the rest of it being perfection. For my second card with this set, I went with a sketch I had jotted down from who knows where. I stamped the citrus stamp three times on a white panel. I did a lime, an orange, and a lemon. Then I proceeded to make the rest of the card those colours. I used some paper from Summer Picnic once again. I also double matted the fruity panel, then when that was all set up, I used the now retired envelope glue stick (it makes nice circles) and daubed some on each fruit. I have this thicker style glitter that totally looks like sugar, so that went over the citrus fruits. I wanted a little sentiment, and the word delightful seemed very appropriate. Now, I've used some summer colours, I would like to feel some summer weather! As of now, my hands are popsicles since we don't want to turn the heat back on! 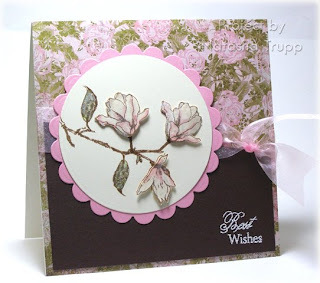 Here's a quick and simple card featuring just a touch of stamping and a touch of patterned paper. I knew I wanted to use these strawberries, so I looked through my paper stash to find anything that would match decently. This paper is by Scenic Route, it's Rockland/Perry Street. I thought about just putting a touch of the paper on the bottom or top, but after I had some there, I realized that it would look good in both locations! Next, I added some Real Red grosgrain, I cannot get enough of that ribbon, I'm sure glad I still have at least 25 yards of it! I added the sentiment, then went about placing the strawberries. I hemmed and hawed as to where they should go, but I'm happy with the final placement. I popped one small one (by the sentiment) and the large one up with pop dots, since I didn't want them just flat on the card. How lovely is this Basic Grey paper? This piece inspired my entire card. I chose my green (True Thyme) based on the colours in it. 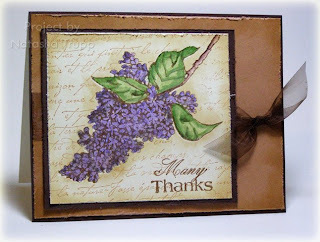 I stamped a topiary from Flourishes Siberian Iris set, then watercoloured that with the True Thyme ink, and some Chocolate Chip. Next, I added cut it out and embossed it with nestabilities, added it on a scalloped Thyme mat, and then added in some chocolate flourishes. 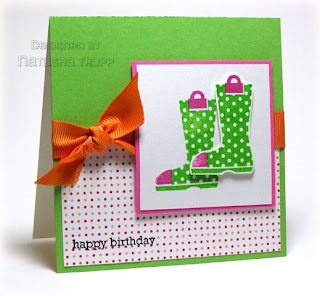 The stamps, nestabilities, paper pad, and ribbon are all available from Flourishes. I made this card some time last week, but I forgot to upload it. I chose a colour palette, and wanted some images that would best showcase that palette. So I went with the Build Your Own Paisley set from gel-a-tins. I love having the paisley pieces separate. It really eases the process for multi-coloured shapes! I just can't get enough of these Doodle Factory Country critters! I really do like colouring, but all too often, I find myself using bold, solid images on my cards. This card, however, itis completely different from that style. I wanted to include both the barn image and the house image in a scene card, so I started with a base 8 inches wide. I coloured in the background with markers, then cut out a few other characters and items for the foreground part of the scene. I have no idea what I would ever use this card for, but it sure was fun to piece together. Whenever I see these Doodle Factory characters, I feel like they should illustrate a children's story of something. I've been having more fun with the Doodle Factory images this weekend. For my first card, I went with a smaller format. Its dimensions are 3.75x5. 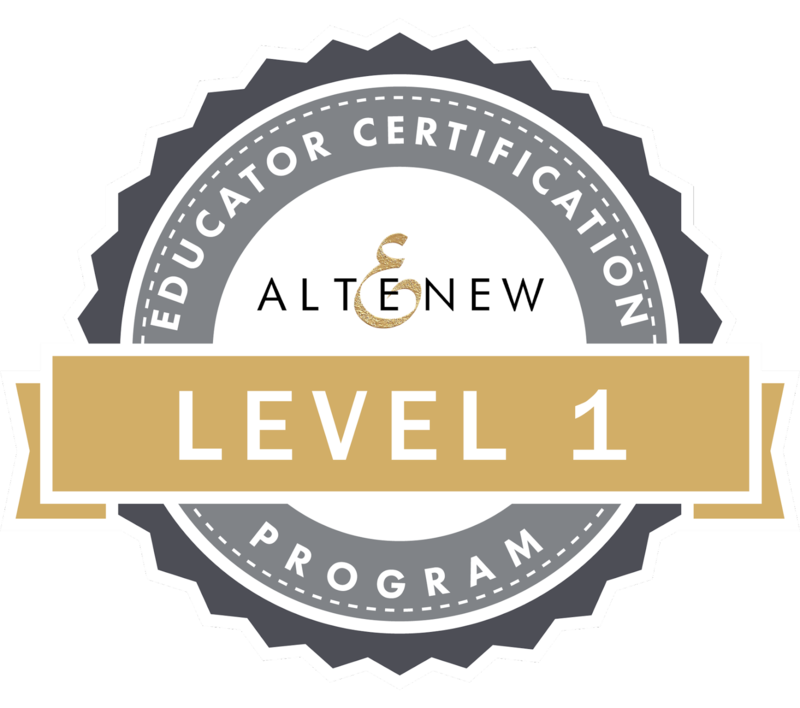 Part of the reason for this was so I could use my mini check background stamp with ease. 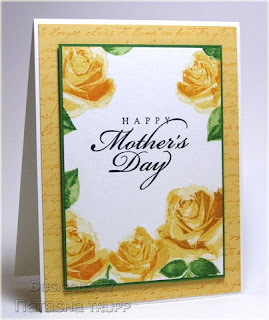 The card itself uses no special techniques, just your basic stamping and pencil crayon colouring. The ribbon on there comes from A Muse. 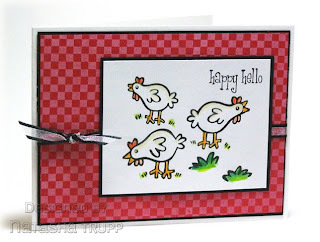 I thought these chickens seemed like they'd be chirping a greeting. On my second card, I wanted some dimension. I stamped the fence first on some cardstock. Then I went about making a mask using some post-it notes. I only have the small ones, so I had to tape 2 together. 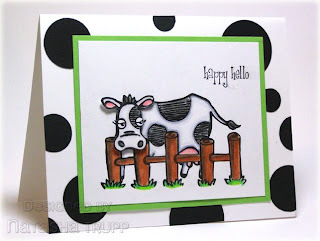 I stamped the cow, but I wanted it to be looking over the fence. So I stamped just the head on another piece of paper, coloured, and cut that out. I coloured everything else, then applied the cow head onto the image with pop dots. The card base is covered with various sized black circle punch outs. 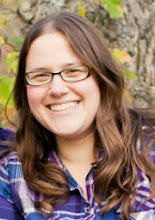 You can't really see the dimension that well on the full card photo, so here's a close-up. 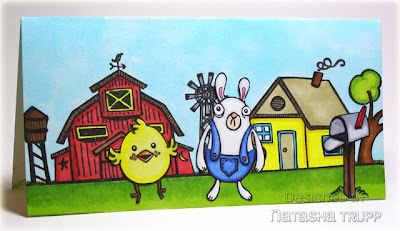 I thought that these two critters from Doodle Factory Country seemed like they should be jumping for joy. 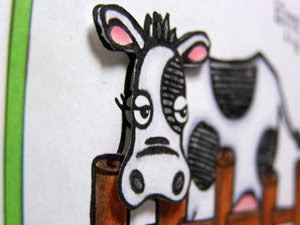 I stamped the animals with Versafine ink, then watercoloured them using markers, reinkers, and an aquapainter. The sentiment comes from the Sun Spirit Studio Thanks set .